Discussion in 'China & Asia Pacific' started by sangos, Apr 5, 2014. RANGOON — Burma’s Deputy Construction Minister Win Myint told The Irrawaddy on Tuesday that there has not been a response yet from the China about how to proceed with the proposed highway linking the planned Kyaukphyu industrial zone on Burma’s west coast, with Ruili in southwest China. Unnamed Construction Ministry officials were quoted in Burmese media in early March as saying that Naypyidaw had turned down a proposed US$2bn Chinese loan to build the proposed roadway—a decision confirmed by Win Myint on Tuesday morning. “We are not going to take the loan,” he told The Irrawaddy, adding that the government prefers that the roadway be developed under a build-operate-transfer (BOT) scheme in which the investors usually recoup their outlay through payments by users, accrued while investors operate the project after it opens. “If they want to construct this highway they can make a joint venture with a Myanmar company. If they want to build this road from the China side, they are welcome,” the deputy minister said. “But there has been no response yet,” he added. The proposed roadway will link Kyaukphyu, site of a proposed 1,000-acre Special Economic Zone (SEZ) and deep-sea port on Burma’s Bay of Bengal coast, to Ruili, a Chinese town just across the border from Muse in Shan State. The Kyaupkphyu SEZ is one of three such zones planned for Burma, along with the Thilawa SEZ outside Rangoon and the less-certain Dawei SEZ on Burma’s south-west coast. In early March, a Singaporean firm won a government tender to create a development plan for the massive Kyaukphyu SEZ. Burma’s Railway Ministry is currently also reviewing a Chinese proposal to build an almost-900 kilometer rail link from Kyaukphyu to Kunming, the latest development in a deal inked in 2011, which is likely also to be built and operated under a BOT scheme. Oil and gas pipelines—the latter drawing from Burma’s Shwe Gas Field in the Bay of Bengal—transit Burma en route to Kunming, the regional capital of Yunnan Province in southwest China, which borders Burma. 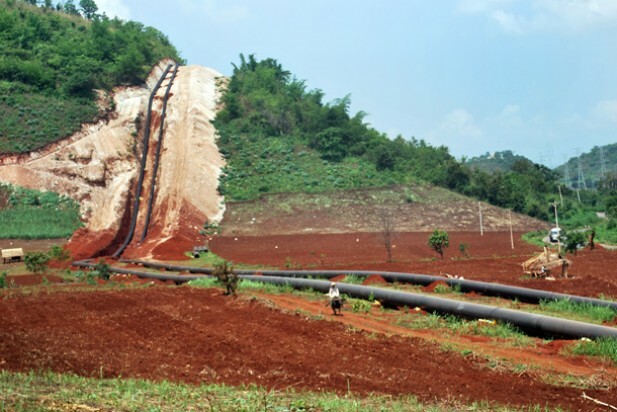 The gas pipeline has been operating since last year, while the oil counterpart is awaiting completion, possibly pending a review of a proposed oil refinery in Yunnan. The oil pipeline and proposed road and rail links from Kyaukphyu are regarded as strategically-important to China. The oil conduit will allow Beijing to pipe oil imports from Africa and the Persian Gulf across Burma to China, rather than take the longer maritime route through the Malacca Strait—an additional 5,000 kilometer journey through some of the world’s busiest waters. The oil and gas pipelines have faced local opposition from residents of Kyaukphyu, while further inland the pipelines have prompted Burmese military reinforcements in ethnic minority areas, in turn sparking skirmishes with ethnic minority militias close to the Burma-China border. Deputy Minister Win Myint earlier on Tuesday addressed an infrastructure conference in the commercial capital Rangoon and said that Burma’s economic prospects depend on modernizing the country’s decrepit infrastructure. “Infrastructure development is the backbone,” the deputy minister reminded delegates at the Myanmar Infrastructure Summit, run by Malaysia’s Confexhub and hosted by the Republic of the Union of Myanmar Federation of Chambers of Commerce and Industry (UMFCCI). Win Myint added that the government hoped that Burma’s economy would grow at 9.1 per cent in 2014, well-ahead of international growth forecasts. Foreign investment would be key to this growth, if it is to come about, Win Myint said, adding that investment in infrastructure is necessary if Burma is to improve its road system. “As of November 2013 there were 28 local companies managing 5,665 kilometers of roads, or 14 per cent of total road in Myanmar, under the BOT system,” he said, adding that the government hopes to increase that percentage in the future.